Analysis From Washington - Another Forced Deportation? 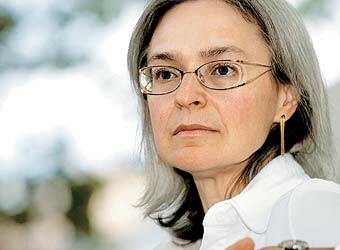 Anna Politkovskaya played a unique role in Russia as the defender of ordinary people’s rights - especially those of ordinary Chechens. Some people who work in conflict zones have walked with death for so long that they seem untouched by it and only more alive. Not just their work, but their sheer survival in a hell of human suffering becomes an example to others. Anna Politkovskaya had that aura - until she was murdered in her apartment block in Moscow last Saturday. What adds to the grief and anger at her death is disbelief. Anna had defied death so often that she had come to seem untouchable. Anna’s faults were also her shining strengths. Her compassion went beyond politeness. She had a deep emotional sympathy for the persecuted that filled her journalism. She was extraordinarily tough. When I last saw her at a conference in Sweden last month she was, as ever, gaunt, slight, steely, exasperated, making needle-sharp interventions. She harangued respected human rights campaigners over some perceived failing with the same fierceness with which she would tackle a Russian bureaucrat. She weighed everyone in the balance, except the powerless, and found them wanting. Anna played a unique role in Russia as the defender of ordinary people’s rights - especially those of ordinary Chechens. She made many dozen of visits to the North Caucasus, starting in 1999 at the beginning of the second war in Chechnya launched by soon-to-be president Vladimir Putin. A forty-something mother of two teenager children, she had no interest in the thrills of a front-line reporter, but began a painstaking chronicle of how the Russian war machine was crushing people who were supposedly its citizens. With the rest of the Russian media kowtowing to the official line or keeping quiet and western journalists as good as banned from the war-zone, it felt at times that it was just one woman against the entire state. If the officials began to loathe her and most of the media shunned her, ordinary people knew what kind of person she was. In her tiny office in Moscow, I saw her collect that day’s sheaf of letters from people with a story to tell, believing that she was the only person in Russia who could speak up for them. The trouble was not Anna, but that her audience was not ready for what she wanted to tell them. Her newspaper, Novaya Gazeta, is a relatively low-circulation liberal weekly newspaper in a country where the main television channels and mainstream press now all routinely toe the Kremlin line. Anna collected a whole shelf-full of international journalistic prizes, but she seemed mainly interested in the prize-giving ceremonies as a forum for reminding westerners that they must do something about this dark corner of Europe - and she was generally disappointed. Anna never stayed still. As the conflict in Chechnya ebbed, she turned her fierce attention to the growing problems of other parts of the North Caucasus, reporting on the deteriorating human rights situation in Dagestan and Kabardino-Balkaria. In Sweden, she raised the pressing issue of the dozens of young men who had been “designated as terrorists” in fabricated court cases and were now serving long pitiless sentences in Russian jails. If they ever get out, they will be natural converts to revenge and political violence. What drove her to keep going, despite the risks? She had faced death before. She was threatened with death once in the hills of Chechnya and apparently poisoned on the flight she took to cover the Beslan hostage seizure. For a time, she took death threats sufficiently seriously to take refuge in Vienna, but then decided to come home. It seemed to be a case of her wanting to keep faith with the multitude of people whose story needed to be told - and the awareness that if she did not do it, no one else would. I remember clearly her talking about some policy shift or other in Moscow towards Chechnya, how it lessened the chances of justice being done for war crimes committed. Few people seemed to care, but Anna looked wounded. “But I have to look the relatives of those who died in the face,” she said. These people were her judges and she felt unworthy. And if even she felt unworthy, that is a great indictment of the rest of us. Thomas de Waal is IWPR’s Caucasus Editor.